The chart below gives information about the UK's ageing population in 1985 and makes predictions for 2035. In Writing Task 1, it is essential to understand what the graph or chart is representing. Look closely at the information in the instructions as well as all details of the graph or chart. The graph shows how the size and distribution of the UK's ageing population is likely to change over a 50-year period. Overall, the proportions are predicted to increase in all UK countries. In 1985, 15 per cent of the UK population was over 65, but by 2035, this will account for 23 per cent of the total population. A closer look at the data reveals that the ageing population is expected to rise more in some parts of the UK than in other. In 1985, Wales had the highest percentage of people aged 65 and over, at 16 per cent. The second-largest group could be found in England and the third in Scotland. 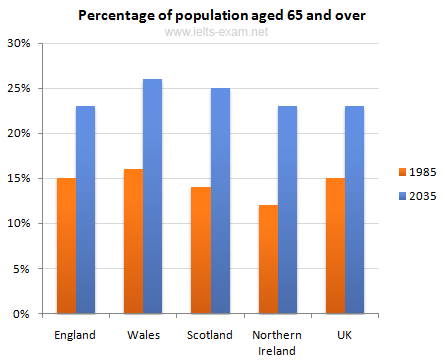 Northern Ireland had lowest proportion, with 12 per cent aged 65 and over. By 2035, Wales is still going to have by far the greatest percentage of over 65s, with figures likely to reach 26 per cent. However, the biggest increases in this age group, relative to the rest of the population, are predicted to occur in Northern Ireland and Scotland. In Northern Ireland, for example, this figure will increase almost double to 23 per cent.